There are many centuries of art to discover here at WAM. Our new Art Carts: Family Fun activities take art, as well as the cultures and history of that art, and offer a new way of seeing and experiencing it. From discovering how the Hunt Mosaic was made and how it got to WAM to looking at shards of pottery and discovering the puzzle that real world archaeologists face every day, there’s so much to explore. Look at Early America portraits, try on the clothes they wore, and discover how they lived. Study Roman faces to discover gods and emperors and how, sometimes, they were the same. Or, learn to write like an Egyptian. There are many more opportunities to interact with art and the past – or even the present. 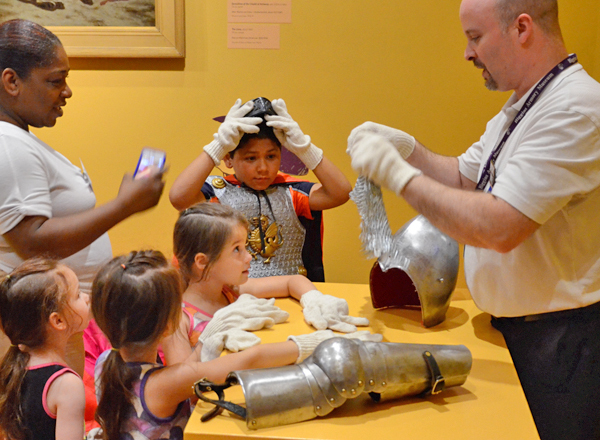 Led by our knowledgeable—and fun—educators, these lively gallery get-togethers are for all ages! Art Carts are located around the Museum. Ask at our Information Desks for more on times and locations or see our website.